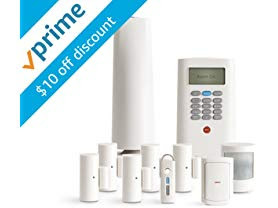 Hurry over to Woot.com because right now this SimpliSafe 10-Piece Wireless Home Security System is just $169.99 (Reg. $269.99)! SimpliSafe is the best value wireless security system on the market: SimpliSafe is the only fully featured alarm system that offers 24/7 alarm monitoring for just $14.99/month with no-contracts, and includes a free cellular link. And SimpliSafe is wireless, meaning DIY installation is a cinch, and there's no hard-wiring or drilling required. Our kits feature pre-programed sensors that start working instantly—right out of the box. All packages are fully customizable, so you can start with the sensor listed in this package and add more sensors whenever you want by logging into your account.